A native of Maysville, Kentucky, and a Maysville High School graduate, Major General Earnest O. Robbins II received the Bachelor of Science degree in Civil Engineering from the University of Kentucky in 1969. As an undergraduate, he was the recipient of a Kentucky Highway Department Scholarship and participated in Air Force ROTC. He actively participated in engineering student organizations including ASCE, ITE, and KSPE. He was a member of Triangle Fraternity, and an editor of the College’s Kentucky Engineer magazine. After graduation, General Robbins worked for the Kentucky Highway Department for four months before he was called to active duty with the United States Air Force at Wright-Patterson Air Force Base (AFB), Ohio. Since that time, he led an illustrious military career, rising to the rank of Major General. Of the 361,000 active duty personnel in the Air Force, about 69,000 are commissioned officers, and of those, only 0.2 percent hold the rank of Major General or above. 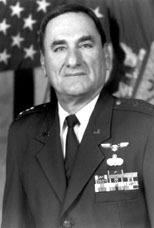 General Robbins served in various Air Force civil engineer positions in the U.S., Philippines, Thailand, and Germany at base, Major Air Command, and Headquarters levels. His duties have taken him to 49 states and 45 foreign countries. “Civil Engineering” in the Air Force is a diverse functional specialty which includes multiple engineering/architectural/technical disciplines. As the senior officer in the career field, General Robbins provided policy/oversight for, and was responsible for organizing, training and equipping the 61,000-person civil engineering force in the active force, the Air Force Reserve, and the Air National Guard. He oversaw programs with a combined budget of more than $6 billion per year or approximately eight percent of the entire Air Force budget. His duties also encompassed planning, development, construction, maintenance, utilities, and environmental quality for the Air Force’s 86 major bases and 82 smaller installations worldwide. These properties were valued at $196 billion and encompassed 10 million acres of land or 50 percent of all land owned by the U. S. military. His responsibilities included combat and contingency engineering, aircraft crash response and rescue, housing, fire protection, explosive ordnance disposal, and disaster preparedness. Also included was protection of some of the most sensitive environmental wetlands and species in the country. Additionally, he oversaw the Air Force Civil Engineer Support Agency, Tyndall AFB, Florida, and the Air Force Center for Environmental Excellence, Brooks AFB, Texas . His duties as the Civil Engineer required him to work daily with senior Department of Defense officials, members of Congress, foreign dignitaries and senior military officers, and state and local officials. He shared chairmanship of several international bilateral environmental steering committees with his counterparts in the respective Ministries of Defense, including Russia, Italy, the Philippines, and Thailand . General Robbins helped provide the engineering support necessary for U.S. Air Force and allied forces’ involvement in Southeast Asia, Desert Storm, Bosnia, and Kosovo. Likewise, he organized and directed engineering efforts to assist in humanitarian and natural disaster relief operations in Central America, Africa , and the Pacific Basin . In 1995, he was awarded the Society of Military Engineers’ Newman Medal as the outstanding officer in Air Force Civil Engineering. In 1989, he was the first military officer recognized as one of America ‘s Top Ten Outstanding Public Works Professionals by the American Public Works Association. He has been awarded numerous military decorations including the Air Force Commendation Medal, Meritorious Service Medal, and the Legion of Merit Award. General Robbins holds a Master’s degree in Civil Engineering from Arizona State University and is a graduate of the Senior Executives in National and International Security Management program in the John F. Kennedy School of Government, Harvard University . He is a distinguished graduate of both the Air Force Squadron Officer School and Air Command and Staff College, and a graduate of the Air War College . Professionally, General Robbins was active in the 25,000 member Society of American Military Engineers and served as its National President. He is a life member of the Air Force Association, the UK Alumni Association, and the College of Engineering Alumni Association . General Robbins and his wife, the former Donna Murrah, reside in Washington , D.C. They are the parents of four daughters, Pam Conte, Kristen Robbins, Laura Hendley, and Karen Carlson. In his free time he enjoys snow skiing, golf, travel, and reading.